It is hard to believe, but it has been 12 months since the TEAM! marathon and 11 since our last post was written. However, don't let yourself be beguiled into thinking that this meant that there were not three members of the DreamTEAM! for whom 2013 was enough! Don't be lulled in to a false sense of security; that a hardy trio of bonkers-boys were not once more hitting the bricks and pounding out those long, cold winter miles for another dose of Marathon Glory! Don't think for one minute that there were not three mad marathoners once more raising even more money for charity! For Lo, it came to pass on Sunday April 14th 2014, that Express-Elliot, Jogging-James and Dynamo-Darren toed the line at Blackheath once more! All three not only managed to complete the course but they all beat their 2013 times! 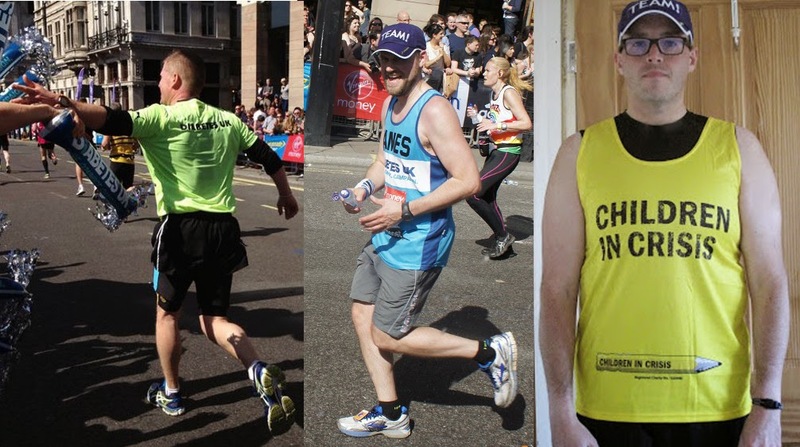 This year, Darren was running for Children In Crisis, Elliot was running once again for Diabetes UK and although James succeeded in getting a place through the public ballot, he chose to use the opportunity to again raise money for Diabetes UK. So far, for 2014, they have raised a mighty £6,200 between them!